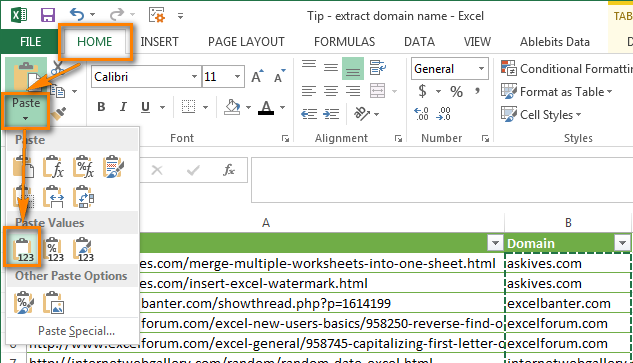 A few tips and pieces of advice will help you get domain names from a list of URLs using Excel formulas. Two variations of the formula let you extract the domain names with and without www. regardless of the URL protocol (http, https, ftp etc. are supported). The solution works in all modern versions of Excel, from 2010 through 2016. If you are concerned with promoting your web-site (like I am) or doing SEO at the professional level promoting clients' web-sites for money, you often have to process and analyze huge lists of URLs: Google Analytics reports on traffic acquisition, Webmaster tools reports on new links, reports on backlinks to your competitors' web-sites (which do contain a great lot of interesting facts ;) ) and so on, and so forth. To process such lists, from ten to a million links, Microsoft Excel makes an ideal tool. It is powerful, agile, extendable, and lets you send a report to your client directly from an Excel sheet. When analyzing a list of URLs, you often need to perform the following tasks: get domain names for further processing, group URLs by domain, remove links from already processed domains, compare and merge two tables by domain names etc. As an example, let's take a snippet of ablebits.com's backlinks report generated by Google Webmaster Tools. Tip: I'd recommend using ahrefs.com to timely spot new links to your own site and your competitors' web-sites. Add the "Domain" column to the end of your table. We have exported the data from a CSV file, which is why in terms of Excel our data are in a simple range. Press Ctrl + T to convert them to an Excel table because it is far more convenient to work with. 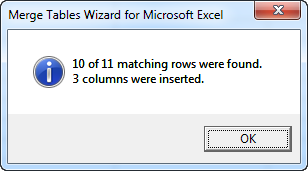 The good thing is that we don't have to use either an additional column or VBA macro. In fact, using VBA macros to automate your Excel tasks is not so difficult as it may seem, see a very good article - Tutorial with Excel examples about Macros. But in this particular case, we do not actually need them, it's quicker and easier to go with a formula. You need to leave all other domain names of the 3rd level, otherwise you would mess up links from different sites, e.g. with "co.uk" domain or from different accounts on blogspot.com etc. 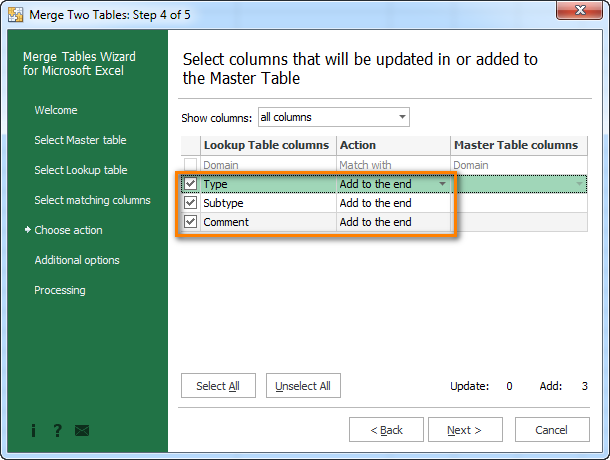 Since we have a full-fledged table, Excel automatically copies the formula across all cells in the column. Done! We have a column with extracted domain names. 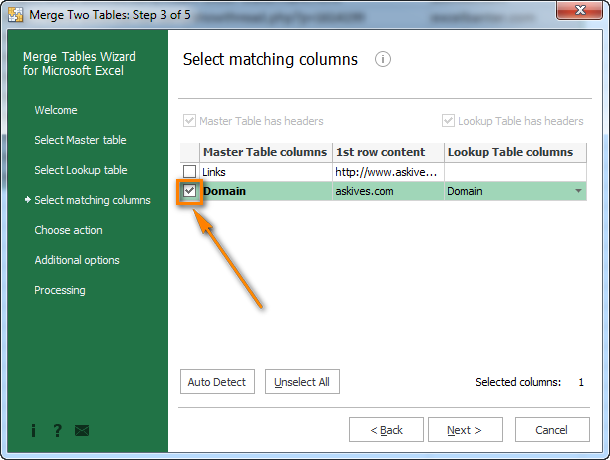 In the next section you will learn how you can process a list of URLs based on the Domain column. Click on any cell in the Domain column and press Ctrl+Space to select all the cells in that column. Press Ctrl + C to copy the data to Clipboard, then go to the Home tab, click the "Paste" button and select "Value" from the drop-down menu. Here you will find a few tips on further processing of the URL list, from on my own experience. Click on any cell in the Domain column. Sort your table by Domain: go to the Data tab and click on the A-Z button. Convert your table back to a range: click on any cell in the table, go to the Design tab and click the "Convert to the range" button. Go to the Data tab and click the "Subtotal" icon. 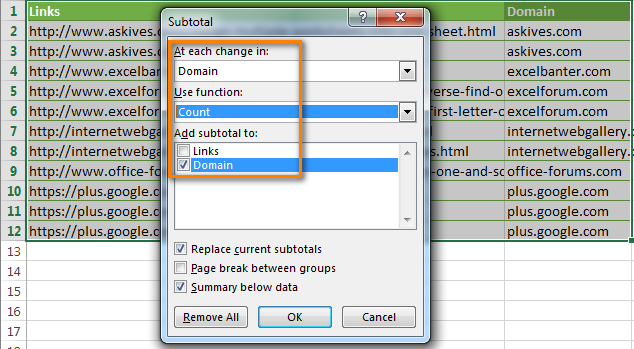 In the "Subtotal" dialog box, select the following options: At each change in: "Domain" use function Count and Add subtotal to Domain. Excel has created an outline of your data on the left hand side of the screen. There are 3 levels of the outline and what you see now is the expanded view, or level 3 view. Click number 2 in the upper left hand corner to display the final data by domains, and then you can click the plus and minus signs (+ / -) in order to expand / collapse the details for each domain. In our previous section we showed how to group URLs by domain. Instead of grouping, you can quickly color duplicate entries of the same domain name in your URLs. For more details please see how to automatically highlight duplicates in Excel. You may have one or several separate Excel worksheets where you keep a list of domain names. Your tables may contain links that you don't want to work with, like spam or the domains you already processed. You may also need to keep a list of domains with interesting links and delete all other ones. This is the most advanced way and the one I personally prefer. 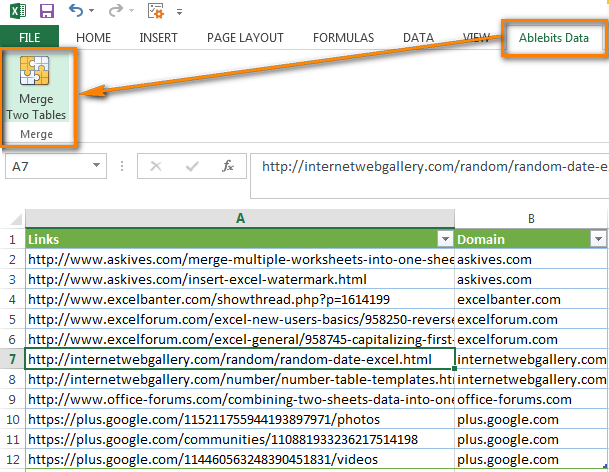 Suppose, you have a separate Excel worksheet with reference data for each domain you ever worked with. This workbook keeps webmaster contacts for link exchange and the date when your website was mentioned in this domain. There can also be types/subtypes of websites and a separate column with your comments like on the screenshot below. As soon as you get a new list of links you can match two tables by domain name and merge the information from the domain lookup table and your new URLs sheet in just two minutes. As a result you will get the domain name as well as the website category and your comments. This will let you see the URLs from the list you need to delete and those you need to process. This nifty tool will match and merge two Excel 2013-2003 worksheets in a flash. You can use one or several columns as the unique identifier, update existing columns in the master worksheet or add new from the lookup table. Feel free to read more about Merge Tables Wizard on our website. Open your URLs list in Excel and extract domain names as described above. Select any cell in your table. Then go to the Ablebits Data tab and click on the Merge Two Tables icon to run the add-in. Press the Next button twice and select your worksheet with the domains information as the Lookup Table. Tick the checkbox next to Domain to identify it as the matching column. Select what information about the domain you want to add to the URLs list and click Next. Press the Finish button. When the processing is over, the add-in will show you a message with the details of the merge. Just a few seconds - and you get all information about each domain name at a glance. 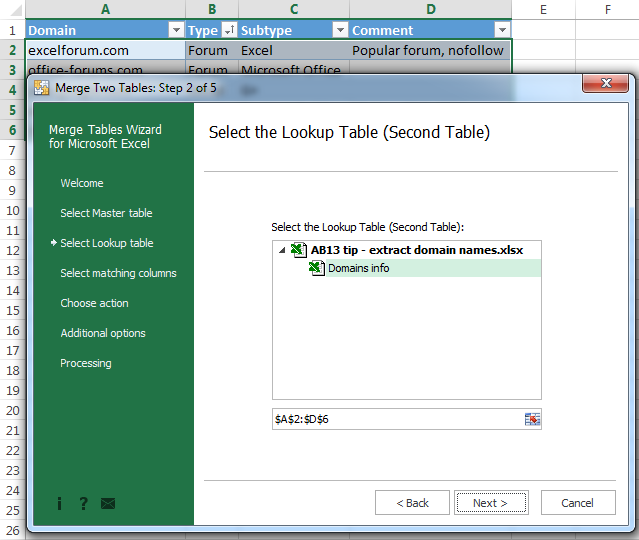 You can download Merge Tables Wizard for Excel, run it on your data and see how useful it can be. If you are interested to get a free add-in for extracting domain names and subfolders of the root domain (.com, .edu, .us etc.) from the URL list, simply drop us a comment. When doing this, please specify your Excel version, e.g. Excel 2010 64-bit, and enter your email address in the corresponding field (do not worry, it won't be displayed publically). If we have a decent number of votes, we will create such and add-in and I let you know. Thank you in advance! 28 Responses to "How to quickly extract domain names from URLs in Excel"
Dude, this is complete madness of the formulaes of Excel. Excellent tutorial and very much helpful.. Keep it up!!! can you please make a video of this reading the entire article is a bit time consuming :( specially when you are in the office. Been using it a lot recently as I've been working with lots of link exports. It's been a real time saver. Thank you for your feedback, Sam. If there are any other topics that may be of interest to you, please let me know and I will try to cover them in the next posts. It seems to be missing one option if a URL has no / at the end it gives an error. How could I fix the formula to include this? where A2 is the cell where the URL is located. The formula basically searches for the "/" after the 9th character in cell A2 and cuts everything out when it returns. Your formula works well for this URL type - http://www.web-site.com, however it won’t work if a URL includes a protocol. For example, if you have https://www.ablebits.com/office-addins-blog/, the formula will produce "https" rather than "ablebits.com". Thank You !! It works! This one is compact and good but not sufficient for my needs. We have URLs in as good as every possible (and impossible) format. We have URLs with protocol, without protocol, including www, excluding it, already exist of only the domain, exist of only domain and location, includes parameters and so on. I think you get the point. One example would be "1und1.de/index.php?page=platin_umetz"
This is a very common format of URLs we have as data. If you find some URL that does not work with this formula, please let me know. We can still refine this further. i need only extensions in a seperate tab , so that i can easily filter all .coms etc ..
We can use this formula too. In the IF(ISERROR) formula mentioned above how do we return a null value if the reference cell is blank. How would you extract the domain name from the fqdn if it isn't part of the url. Thanks a lot for sharing how to extract a domain with Excel. Should have changed AN2 to A1 (or wherever your list of domains is), but you get the point. This is absolutely a great site , I appreciate all the effort . I need a help now, Is there a macro to extract the exact Company Name from web, if we have a list of company domains as excel input please (especially when the domains look weird )? I need to remove also the subdomain, but this formula doesn't do that. Any ideas?